The nice thing about stone pavers for patio design is that you have a lot of flexibility in how you arrange the pavers. By using a different arrangement or pattern, the pavers will give your patio area a completely different and unique look. Some of the more common stone patterns, as explained below, have become traditional favorites because of their aesthetic beauty, ease of installation, and durability. As the name implies, the brick pattern resembles a brick wall, with each row of pavers offset from the previous by half a brick or paver. The brick pattern for patio pavers works well for small patios as well as large spaces. The line of each row gives the space balance and symmetry. This is a classic and traditional arrangement that is easy enough for the do-it-yourselfer to handle on his or her own. The herring bone pattern adds a bit of charm and character to the patio area. With the herring bone arrangement, the pavers are positioned in alternate directions to created a V shaped, or jagged pattern. This arrangement is well-suited for larger patio spaces and high traffic areas because the pavers are virtually locked into place by their arrangement. The basket weave pattern is charming and whimsical and nicely complements older homes, especially those with a vintage feel. In this pattern, two pavers are paired together and the two are arranged alternating between horizontal and vertical pairs. The overall effect is lines and columns that are reminiscent of a woven basket. Because the pavers are in tight pairs, this pattern is strong and stands up to wear and tear quite well. 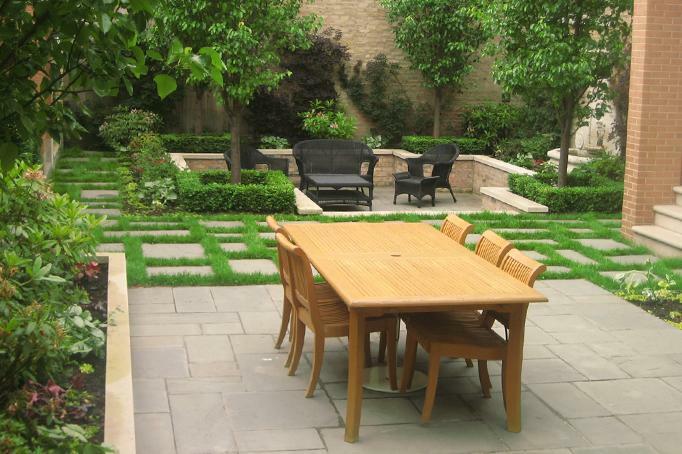 Although it is a busy pattern, it works well for small and medium sized patios, as well as larger ones. Using square pavers, you can create a circular pattern by starting in the center and arranging the pavers around the center point. As you add more rows, the circle becomes bigger and wider. The spaces in between the pavers can be filled with loose gravel, dirt, grass, or even concrete, the same as you would do with the other paver patterns. The circle pattern is ideal for patio spaces that are freestanding and not located adjacent to the house. A bit fancier and a lot harder to do on your own, the fan pattern is common across Europe and provides a stately, old-world look to a home. Because it is more difficult to achieve this pattern, many paver manufacturers offer kits to help do-it-yourselfers create this elegant and sophisticated fan pattern. By using different shaped pavers…square or rectangle … as well as pavers of different colors and textures, it is possible to create a stunning focal point to your outdoor living space. An attractive and unique patio area will provide you and your family with a solid foundation for entertaining and dining al fresco.